The event highlighted the importance of the Bioscience sector in Connecticut – including taking steps towards urging that new improvements be made to bring Connecticut successfully into the future. 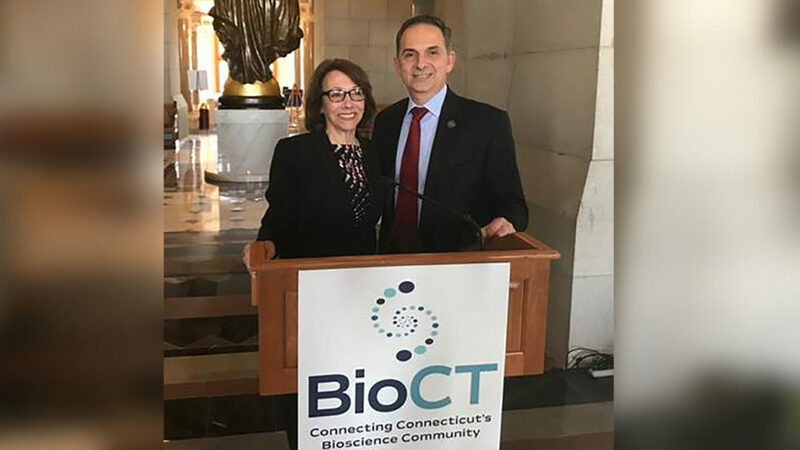 (l to r): Dawn Hocevar President and CEO of Bio CT and State Representative Dave Yaccarino attended Bioscience Advocacy Day at the State Capitol in Hartford on Wednesday, March 14. State Rep. Dave Yaccarino (R-North Haven) the Ranking Member of the legislature’s Commerce Committee on Wednesday, March 14, joined state officials along with the bioscience community at Bioscience Advocacy Day at the State Capitol in Hartford to discuss the importance of bioscience to our state’s economy and future. This event highlighted the importance of the Bioscience sector in Connecticut – including taking steps towards urging that new improvements be made to bring Connecticut successfully into the future. “Bioscience leads to high-paying sustainable jobs, early detection of diseases, and ultimately cures. With greater growth of this important industry comes many others reciprocal benefits. In New Haven County we have great organizations like Yale, Mount Sinai, SEMA 4, Quinnipiac, Southern Connecticut State University and the University of New Haven that make us an ideal location to become a bioscience hub,” said Rep. Yaccarino. “I believe that Connecticut has what it takes to become a leader in the bioscience industry” added Rep. Yaccarino.